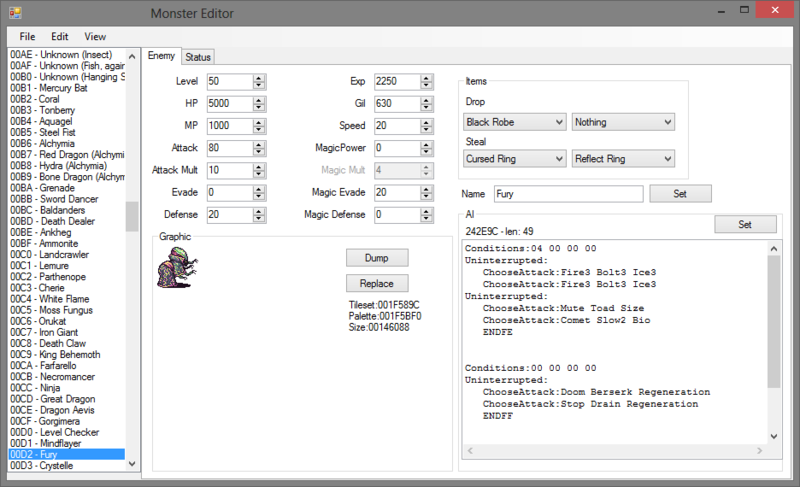 This editor includes the ability to edit any monster and battles in Final Fantasy 5 Advance including multiple dummied and non placed enemies. It can now also edit items and jobs and view backgrounds. Currently the most powerful, versatile, and easy to use hacking tool for Final Fantasy 5 Advance. Its speciality is in editing monster stats and resistances, and if that is all you plan on doing, it is perfect. The editor for classes also works quite well, and in some ways is arguably better than another tool that specializes in editing classes. However, all of the other features of this tool are buggy in one way or another. Editing the common or rare drops of a monster switches their positions, so the new common drop becomes the rare drop, and vice versa; easy to work around, but annoying. When editing the AI of monsters, special conditions (such as “HP 10000″ or “Alone”, for example) are untranslated from Hex and must be looked up elsewhere to make any sense of them, and it gives no indication of whether or not there is any more room in the monster’s code to give it more complex AI; if you attempt to save your edits to the rom after adding onto the AI of a monster with no more room, the program will crash, and any edits since your last save will be lost. The editor for battles is user unfriendly and only partially translated from hex, but mostly functional… though it runs into trouble if you attempt to change a battle’s background song or add any of the new monsters or bosses added for the bonus dungeon. The editor for items is full of mislabled stats, untanslated numbers, buttons that just plain don’t work right at all, and is only half usable; consumable items seem fine, and you should be able to edit weapons with just some minor frustration, but don’t even bother trying to use the armor editor. Overall, despite all its problems, it is still better for hacking many parts of FF5A than anything else currently available, and if these bugs were fixed, it would be able to rival Disch’s FFHackster for Final Fantasy 1.